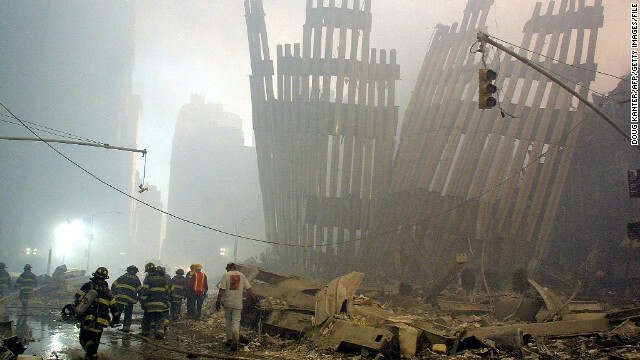 It’s a story we’ve been reporting on for more than a decade: The health of the brave, heroic responders who breathed in the dust, debris and fumes at the World Trade Center site in the hours, days and years following the September 11, 2001 terrorist attacks. Today’s headline: Rescue and recovery workers exposed to the dust, debris and fumes have already exhibited an increased incidence of prostate and thyroid cancers, plus multiple myeloma, according to a study published in The Journal of the American Medical Association. No increased incidence was observed among those not involved with rescue/recovery. Twenty-three types of cancer were investigated. This is the first WTC incidence study to include both sexes, all ages and races, and both rescue/recovery workers, as well as those not involved in rescue/recovery. The observational study, conducted by the New York City Department of Health and Mental Hygiene, looked at nearly 56,000 New York state residents enrolled in the World Trade Center Health Registry in 2003-2004, who were tracked from enrollment through December 2008. “It’s important to note that the latest results in this study are from 2008,” said Dr. Jacqueline Moline, chair of the Department of Population Health at North Shore-LIJ Health System. “That’s only seven years (after the attack). We really need to report out through 2016, after a latency period of 15 years (at which point more cancers are likely to have manifested)." For now, we know that the rescue/recovery workers were exposed to known and suspected carcinogens, including asbestos, silica, benzene, polychlorinated biphenyls, polycyclic aromatic hydrocarbons, volatile organic compounds (VOCs) and numerous metals. A few caveats to note. First off, WTC exposures were self-reported two to three years after the attacks, thereby making them subject to recall error. Second, the cancer cases -– which were identified through linkages with state cancer registries – might be underestimated, especially among those respondents who didn’t provide a Social Security number. Lastly, the study’s authors lacked information on other risk factors, including family cancer history, occupational exposures before or after 9/11, and history of exposure to other environmental carcinogens, as well as medical screening history especially for prostate cancer. Of course, only time will provide a true picture of the depth and breadth of cancer cases arising from the aftermath of 9/11. Lung cancer, for example, typically has a longer latency period, and will therefore remain a major concern in the years ahead. Above all, Moline stresses the importance of uninterrupted funding in the years ahead. “We need to maintain our ability to monitor those affected and provide them with the very best care,” she said. Early detection and treatment, after all, saves lives. For those who were exposed: maintain vigilance, disclose your full medical history to your doctor and be on high alert for earlier presentations of illness than anticipated. Hope this spurs the government to reimburse those brave citizens for these problems. They sacrificed much. I WANT LOTS OF OPINIONS WHY PEOPLE CAN BE INVOLVED IN WTC DUST AFTERMATH & COME DOWN W MULTIPLE ILLNESSES AND ARE BEING TOLD THAT THIS TOXIC SUBSTANCE THAT SPREAD MILES THROUGH THE AIR ARE BEING TOLD THAT THE ILLNESSES ARE NOT LINKED TO THIS CATOSTROPHIC EVENT THAT TOOK PLACE IN NYC IN 2001? I've never met a firefighter who wasn't a smoker. Not a one.